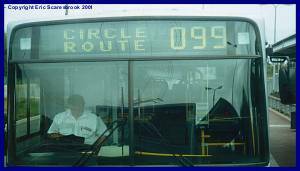 Bus from Rutty's Bus Service at Lidcombe station, 16 September 2000. Bus from unknown company at Lidcombe station, 16 September 2000. Former Parramatta-Ryde Bus Service at Lidcombe station, 16 September 2000. Bus from Blue Ribbon at Lidcombe station, 16 September 2000. Bus from Kings at Lidcombe station, 16 September 2000. Bus from Sonters at Lidcombe station, 16 September 2000. Bus from Pioneer Coaches at Lidcombe station, 16 September 2000. Bus from Lawrence Bus Service at Lidcombe station, 16 September 2000. 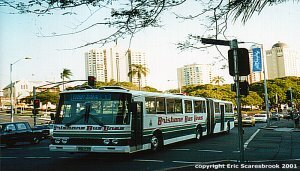 Bus from Kirklands at Lidcombe station, 16 September 2000. 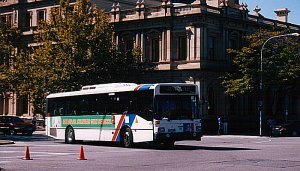 Bus from Martins Albury at Lidcombe station, 16 September 2000. Inverell Bus at Lidcombe station, 16 September 2000. Fullers bus from Coutts Crossing at Lidcombe station, 16 September 2000. Morisset Bus Service bus at Lidcombe station, 16 September 2000. Forster Bus Service bus at Lidcombe station, 16 September 2000.